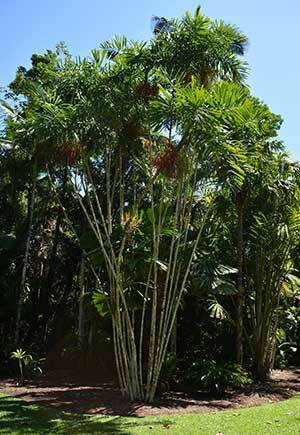 The Macarthur Palm is a clump forming palm with attractive foliage. It is used both as an indoor palm and and outdoor palm. Originally from tropical far north Australia it has gained popularity with landscapers in recent years. In the tropical climates, this is a tree that is very easy to grow. In cooler climates this attractive palm tree is used as an indoor plant, it can be seen growing in shaping centres, where the warm humid environment provided suit it growth habit. Growth rate will vary depending on conditions, in tropical to sub tropical areas it will be faster than in cooler climates. Propagation is from seed or by dividing established clumps. When dividing, choose smaller plants so that you can avoid damage to the root system and trunk. If growing from seeds, they will need to be scarified before germinating. This is a palm tree that has found its way around the world and is available for dale on the Hawaiian Islands as well as in Florida. Common Names – Macarthur Palm, Hurricane Palm and Cluster Palm. Named after Sir William Macarthur, an Australian Botanist. Height – 7 metres to 9 metres. Spread – Clump forming, individual stems to around 7 cm in diameter. Foliage – Feathery and arching fronds. Flowers – Yellow to green forming at the base of the crownshaft.